Among the many hats she wears, Eve Torres is best known as a former wrestler, a martial arts instructor, a dancer, model, and an actress. Even though there is no denying the fact that she is a diva in every sense of the word, Eve carved a niche for herself in the WWE and won some rather interesting awards doing something she enjoyed in the male-dominated world of wrestling. She currently holds a purple belt in Brazillian jiu-jitsu, which she received during her active years as a wrestler. After her retirement, she has continued to work as an instructor at the Gracia Jiu-Jitsu Academy in Torrence, California along with her husband. Read on for a detailed look into how this beauty took the bold step into the world of wrestling. Eve Torres’ life began in Boston Massachuttes where she was born on the 21st day of August 1984. Although she spent a good chunk of her growing up days in Denver, Colorado, she comes from some strong Latino roots of Nicaraguan descent with a mix of German and Swedish blood. She was raised alongside one younger sibling who goes by the name of Phil and is a media personality in the sphere of TV Presenting. There are no specifics about where the diva attended high school, but it is on record that she attended college at The University of Southern California on full tuition, so she must have been an A student in high school. She graduated with honors in Industrial and Systems Engineering. Even though Eve was serious with her studies while she was in school, she also made time for extracurricular activities which in this case fetched her additional income. She had honed her dancing skill on the USC Fly Girls Dance squad and eventually took to featuring in music videos as well as commercials for well-paying companies. She kept up the appearances until graduation and then she went into dancing and modeling as a full-time career choice. Eve Torres’ journey into the world of professional wrestling began in the year 2007 when she took part in WWE’s Diva Search, a reality show that was aired live on Raw in search of capable women who would join the wrestling world as performers. Out of a total of 50 women who participated in the show, Torres clinched the prize and took the crown as winner of Diva Search 2007. The feat saw her defeat Brooke Gilbertson to begin her training for future exploits in the company. She had her first stint on February 1, 2008, in an interview with superstar wrestler Batista. She went on to compete severally in shows whose main aim majority of the time was to pick out the top diva amongst the many in the company. This saw her often compete in arm wrestling, obstacles courses as well as bikini contests. Her role as a diva began to experience a transition when Eve Torres took up a feud against co-diva Michelle McCool who as the story goes, had attacked her earlier. The feud led to a fight which she lost but still kept at the feud especially because it was scripted. She also feuded with other divas and joined tag teams before becoming the manager of Cryme Tyme team made up of Shad and JTG. By 2009, WWE traded Eve Torres to Raw where she lost her first match to Alicia Fox. The following year Torres signed in for a show set up to crown a new champion for the WWE Diva category. she went as far as the semi-finals but was pushed out by Maryse who took the crown. Three months later, she defeated Maryse in the battle royale and won the Diva championship for the first time, subsequently defending it against its previous winner but eventually losing it to Alicia Fox. Torres would go on to win and lose the title a few more times. Eve Torres transitioned again into a leadership position at the WWE when she was made the Executive Administrator of Raw and SmackDown in 2011. She stayed in the role but still did some fighting and diva work before she finally bowed out in 2013. Besides the WWE the star made other appearances in TV shows and films like The Scorpion King 4: Quest for Power and Matador, among others. Eve Torres, husband Gracie, and son. While her career in the WWE lasted, Eve Torres was romantically linked with a host of wrestlers even though a majority of them were based on the scripts they were acting out at the time and as such, do not count as real relationships. In reality, Torres met and fell in love with American Brazilian jiu-jitsu practitioner Rener Gracie while she was taking a training course at the Gracie Academy which he co-owns. They dated for a while and got married in April 2014. 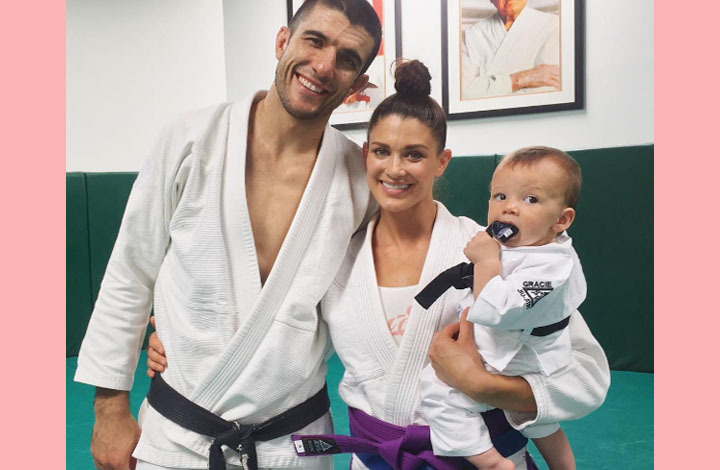 Their union has seen to the birth of two sons; Raeven Gracie born on the 28th of September 2015 and a second son born in 2018. After a successful career as one of the most accomplished divas in the WWE, Torres Gracie who was a 3-time Diva Champion retired in 2013 but is still connected to the company through the WWE Legends Contract. She currently works as an instructor at the Gracie Women Empowered Self-defense program at her husband’s Gracie Academy. Eve Torres also doubles as an ambassador for WWE in addition to her acting stints. These endeavors in addition to her young family have kept the star busy. So, even though she is retired, she is still in the spotlight.